My intuition would say that a part-based decomposition should arise naturally within an autoencoder. To encorporate the next image in an image recognition task, it must be more beneficial to have gradient descent being able to navigate towards the optimal set of neural network weights for that image. 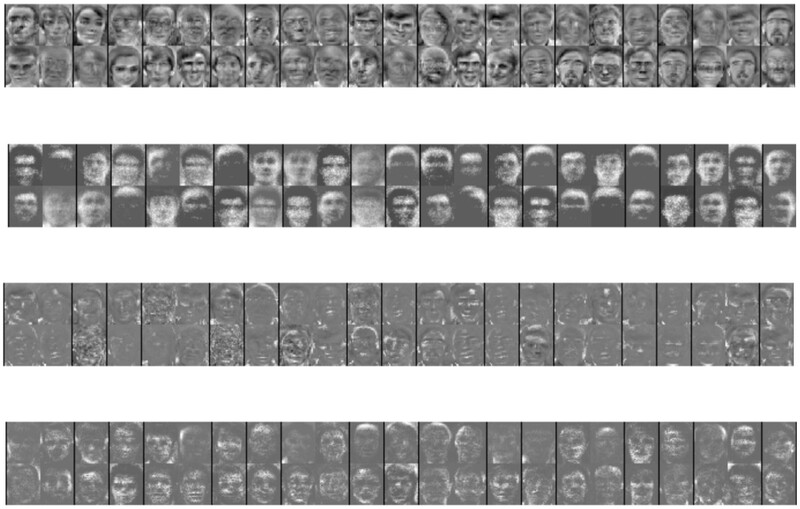 If not, for each image gradient descent is all the time navigating some kind of common denominator, none of the images are actually properly represented. For each new image that is getting better classified, the other images are classified worse. With a proper decomposition learning the next representation will not interfere with previous representations. Grossberg calls this in Adaptive Resonance Theory (ART) catastrophic forgetting. Maybe if we train a network long enough this will be the emerging decomposition strategy indeed. However, this is not what is normally found. The different representations get coupled and there is not a decomposition that allows the network to explore different feature dimensions independently. One of the means to obtain a part-based representation is to force positive or zero weights in a network. In the literature nonnegative matrix factorization can be found. Due to the nonnegativity constraint the features are additive. This leads to a (sparse) basis where through summation “parts” are added up to a “whole” object. For example, faces are built up out of features like eyes, nostrils, mouth, ears, eyebrows, etc. If we do want robots to learn about the world, we can use computer vision. We can employ traditional methods. Build up a full-fledged model from corner detectors, edge detectors, feature descriptors, gradient descriptors, etc. We can also use modern deep learning techniques. One large neural network hopefully captures similarly or even better abstractions compared to the conventional computer vision pipeline. Humans use vision and have perfected this in many ways. It would be silly to not use cameras. Depth sensors can provide information when vision gets obstructed. Humans use glasses, microscopes, infrared goggles, all to enhance our senses. We are basically cyborgs. Robots will benefit from a rich sensory experience just like we do. They want to be cyborgs too. A long, long time ago - namely, in terms of these fast moving times of advances in deep learning - two years (2016), there was once a paper studying how we can teach neural networks to count. This paper is titled “Attend, infer, repeat: Fast scene understanding with generative models” and the authors are Ali Eslami, Nicolas Heess, Theophane Weber, Yuval Tassa (github, nice, he does couchsurfing), David Szepesvari, Koray Kavukcuoglu, and Geoffrey Hinton. A team at Deepmind based in London. This has been a personal interest of mine. I felt it very satisfying that bees for example can count landmarks or at least have a capability that approximates this fairly good. It is such an abstract concept, but very rich. Just take the fact that you can recognize yourself in the mirror (I hope). It’s grounded on something that really strongly believes that there is only one of you, that you are pretty unique. It is interesting to see that this deterministic strategy does not require Monte Carlo updates. It can be seen as a deterministic optimization problem. However, it is definitely possible to solve this deterministic problem stochastically as well! We can formulate it as a stochastic optimization problem! In the dark corners of the academic world there is a rampant fight between practitioners of deep learning and researchers of Bayesian methods. This polemic article testifies to this, although firmly establishing itself as anti-Bayesian. There is not much you can have against Bayes’ rule, so the hate runs deeper than this. I think it stems from the very behavior of Bayesian researchers rewriting existing methods as approximations to Bayesian methods. Ferenc Huszár, a machine learning researcher at Twitter describes some of these approximations. Stochastic gradient descent (SGD) is just variational inference (variational EM) done slightly wrong. Do you have other approximations you can think of?